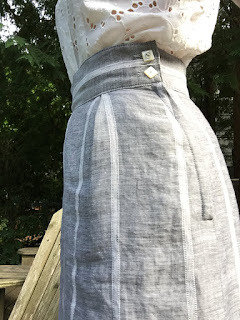 Lovely, the wide waistband and buttons are super! I love them! Are they pleasant to wear? I hope so! Love these! I love the flowiness, the buttons and the color. Wow! 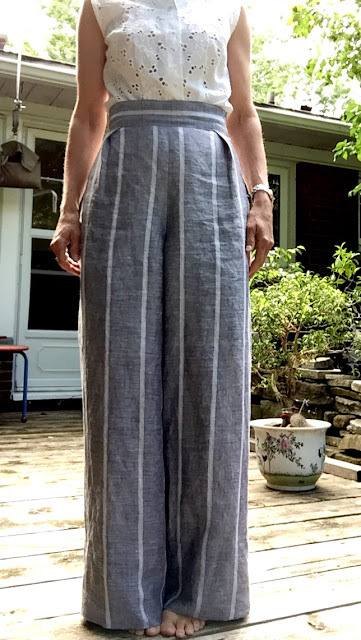 These pants are lovely and what a great job on the fit! These look so comfortable for summer. Does the half-lining show through on the right side? Did you make it in any strategic length to keep that from happening? The half lining is brilliant for this kind of lightweight fabric. Very summery. These look great! I love linen pants that look a little more tailored and not that "backpacker tourist" pajama look.. I sure do like these pants. Maybe you'll get tired of them and send them to me, lol. Your blouse also looks lovely. What pattern is it? These are fantastic on you. Great fabric and I love the deep hem. Must give the lightweight fabric enough weight to hang so beautifully. Great looking pants. Did the deep hem have the effect you desired? They look fabulous on you Kay. Great idea to underline the top, and I'm sure you will think so too every time you go to sit down in them! These are beautiful! What a brilliant idea to underline just the top of the pants. Ditto fabulous, beautiful, great looking etc. I think it would make a stunning outfit with a matching shirt of vertical stripes. It's called "Pyjama Dressing" and only the best people do it – see Julian Schnabel et al. I can see you swanning about on le plage de Cote d'Azur. They look so comfy- perfect for a hot summer day! 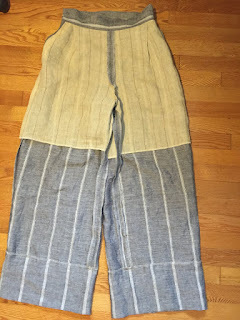 Fantastic summer pants. Well done, as always.